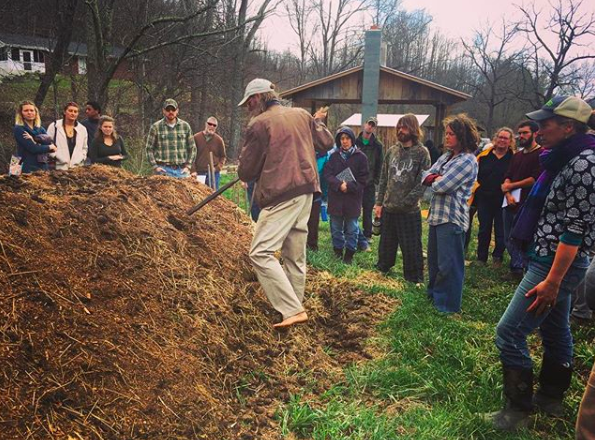 Blue Ridge Collaborative Regional Alliance for Farmer Training (CRAFT) cultivates meaningful mentor relationships between aspiring and experienced farmers. ​We believe that the educational and professional development of tomorrow’s growers and producers informs the health of our diverse local-food system and rural economy. 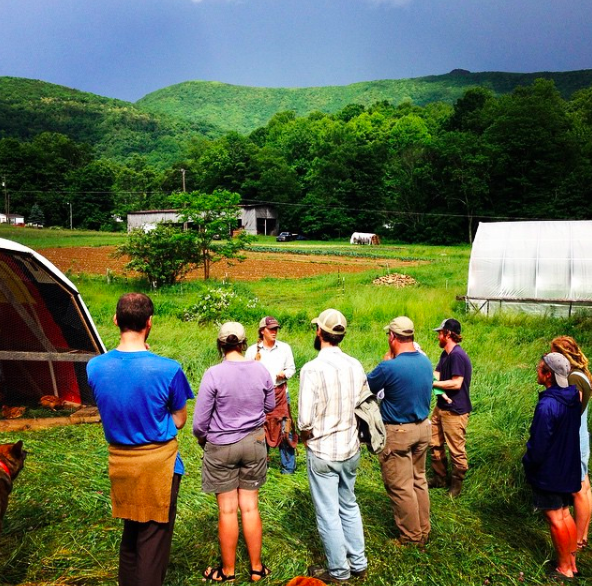 Based upon CRAFT models like Organic Growers School's WNC CRAFT and similar apprenticeship networks, Blue Ridge CRAFT connects aspiring farmers with experienced farmers and encourages innovative on-farm educational and professional experiences. Providing tools to established farmers that will enhance their mentorship abilities is central to Blue Ridge CRAFT's efforts. In the fall of 2014, Blue Ridge Women in Agriculture was approached by established farmers seeking a way to provide structured education and training to their on-farm apprentices. As we work together to form a more resilient and just food system and local economy, Blue Ridge CRAFT believes that is imperative that we encourage candid, meaningful conversations, form durable and inclusive partnerships, engage best practices, and excite innovation and creativity. Blue Ridge Women in Agriculture believes farm interns and farmhands play a vital role in our sustainable-agriculture community. This webpage offers current apprenticeship opportunities for individuals interested in learning more about sustainable agriculture through seasonal experience. Some listings are unpaid educational experiences. Others are paid farm employee positions. Each offers the aspiring farmer the ability to learn more about our sustainable-agriculture community. Blue Ridge CRAFT provides these listings as a service to our community and makes no claim as to the accuracy, suitability, intent, comprehensiveness, or availability of the positions. We encourage apprentices and farmers to hold candid conversations about farm-worker experiences and expectations. To learn more about other apprenticeship listings, visit the Organic Growers School's Apprentice Link, ATTRA's internship/apprenticeship webpage, or Carolina Farm Stewardship Association's internship/apprenticeship webpage. Markets: We sell through our mobile market- Todd's Table. In the summer, we also donate produce to families at Green Valley Elementary School. Preferred Experience: Willingness to learn and work are most important to us. Prior garden/farm experience is helpful but not necessary. Comfortably working outdoors for long hours is a must. Experience in community service or student leadership is a plus. Intern must be comfortable working alone and in small groups. Time Commitment: Schedule is flexible but would like someone to commit to about 10 hours of work each week from April-August. ​There will be two internships available, one to start in April and one in May. Compensation: Intern will be provided with a $1,500 stipend and produce from the gardens. There may be a change in the stipend amount, will update if needed asap. Academic credit may be arranged with your academic department if desired. We include enrichment activities throughout the summer to introduce you to other non-profits, farms and members of the Todd community. Our internship is an opportunity for experiential learning and training where we provide a trellis for our interns to grow not just as gardeners, but as people. This posting closes on: open until filled. Produced on Farm: Cut flowers, seedlings, perennials, and a few vegetables. Markets: Farm direct, the Food Hub and our flower CSA. ​Keywords: Cut flowers, CSA, wedding flowers, farmer florist, flower farm, sustainable, wildlife management. Position: A full season of work. Occasional weekend work, physical labor, eager to learn. Internship, Part-time Employment, Full-time Employment. For a full-time position we require a full season of commitment from the employee. The main farm is 25 miles from Boone, car pooling is sometimes an option but you must have a car. The nursery is in Zionville. ​Variable tasks, farm work, planting through harvest, maybe some market sales or wedding work. We also have a large seed starting operation to supply the farm with seedlings. Mulching and mowing also possible. Will also be looking for an unpaid intern to help with weddings( Friday-Saturday). Time Commitment: We work year around, paid positions are generally mid March through November. Intern commitment 2 months. Employees April through October. Priority give to persons available in April-May for spring planting. ​Compensation: Paid positions are $10/hr. The best time to contact this farm is any time by email or phone. Produced on Farm: TH grows specialty veg for local chefs, selling the surplus at multiple farmers markets. We also grow the ingredients for our small batch artisanal pickles and pesto. We grow in 3 large gardens, including a large hoop house. We have a flock of 65 laying hens. We don't use chemical pesticides, and focus on building the soil, taking care of 16 acres of mostly wooded mountainside, and a large, popular vacation rental home on the property. Preferred Experience: None necessary, but if you are interested in being a farmer, we'll take a look at you first! A willingness to learn is a great start! Intern Responsibilities:Physically demanding, sometimes repetitive work, love the outdoors in any weather, a desire to want to learn farming, about the local food economy, and an open-minded and fun loving demeanor will help. A passion for clean food, good living, and the outdoors is preferred. Compensation: $500 stipend per mo, on site brand new private living quarters, a doz eggs per week, a LOT of amazing veg, and at least 2 communal feasts per week. There will be a 1 week unpaid trial period to size each other up! Please don't apply if you can't commit for the season! This posting closes: When we find the right fit! 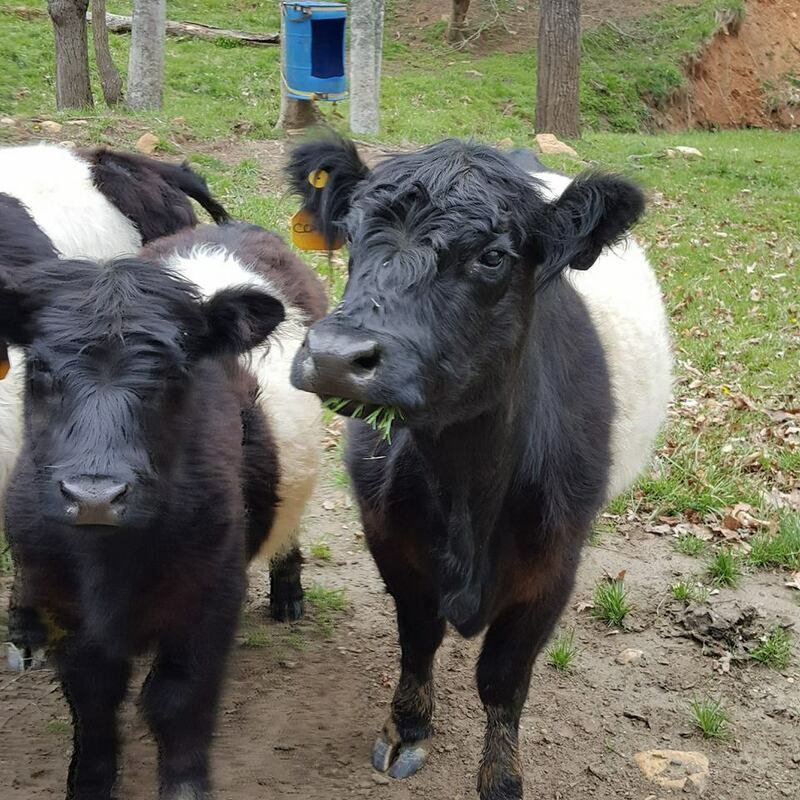 Produced on Farm: We raise grass fed Belted Galloway cattle, pastured pigs and pastured chickens. In addition to the farm portion, I have several renovated historic cabins that we rent out on nightly basis to guests. The main draw on our property is the "Healing" Spring. Discovered in 1883, the water from the spring is recorded to have a cured a wide variety of ailments. I make artisan soap from the water. I also make a selection of jam & jellies for re-sale. 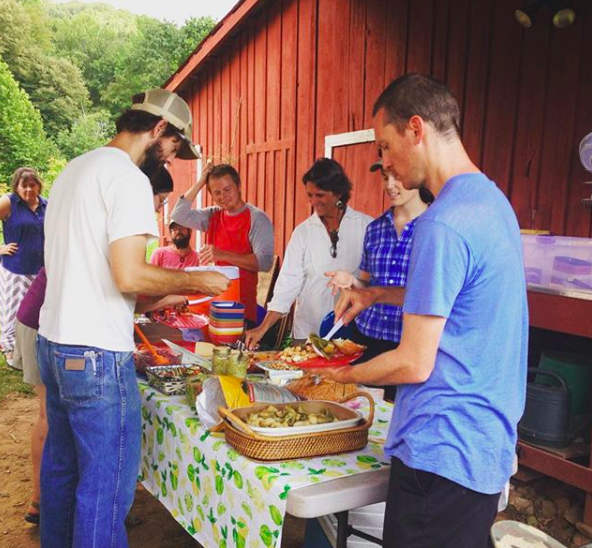 Markets: Ashe County Farmers Market, High Country Food Hub, Healing Springs Farm Store. Other Information: The farm is in Crumpler (Ashe County) which is about 15 minutes from Jefferson / West Jefferson and about 40 to 45 minutes from Boone. It is helpful if you have your own transportation. No drugs. Okay with responsible drinking. Smoking outdoors only. No drama, we get plenty of that from our cows! Intern Responsibilities: The prospective intern needs to understand that farm work is repetitive and physical. I am seeking an intern who can work with all aspects of our farm production. For the cattle, pigs and chickens - this would include: feeding, rotationally grazing, watering, irrigating fields, pasture management, fence building, fence maintenance along with other livestock/ pasture tasks as needed. The intern may be asked to assist with the production of jams & jellies and artisan soaps during times of peak production. The intern will help with general grounds maintenance and support with projects in various areas as needed. If you are interested in construction, we always have construction projects going – so this is an opportunity to learn and grow your skills. We have plenty of rooms, and welcome interns who may want to work on their own projects during their days off (build, grow, raise whatever their interest is). Preferred Experience: No experience necessary, but a good attitude and a willingness to learn. Intern candidates must have a good work ethic, be a self-starter who is interested in learning more about local farming and agri-tourism. The intern should be able to perform manual labor in varied climactic conditions. Knowledge of basic power tools and the ability to drive a tractor is a plus. A valid driver's license is a plus, along with your own transportation. Time Commitment: 4 to 6 hours per day, 5 days a week. Prefer folks who can stay the season April to October, but are willing to discuss shorter stays. Compensation: We offer a private room with WiFi, shared bathroom, kitchen, laundry room. We provide breakfast and lunch and the fixings for dinner. Additionally, after a 2 week trial period, $500 per month. Produced on Farm: A wide variety of produce as well as pasture raised livestock, including pigs, and turkeys. Markets: CSA, Watauga County Farmers' Market, Boone Winter Farmers' Market, and through a variety of local independent establishments in the High Country. Keywords about this farm: Pastured Livestock. Year Rounds Vegetable Production. Sustainable Agriculture. Intern Responsibilities: We value individuals who have a positive attitude, good comprehension skills, and the ability to self motivate themselves to see tasks to completion, in spite of rigor and monotony. When and if issues arise, we value individuals who are able and willing to resolve issues in a respectful manner. Employees/Apprentices at New Life Farm should posses a degree of physical fitness and endurance. Being able to work outside in a variety of elements is important. Employees must provide their own means of transportation, as well as posses a valid Driver’s License. At New Life Farm, we try to operate as a cohesive team that can communicate and execute in an efficient manner all and any tasks we are faced with on a day to day basis. As employees gain experience and a better understanding of each task related to work on the farm, we expect individuals to take initiative and exercise situational awareness as they are engaging in a variety of day to day activities. We expect honesty, open communication, work ethic, attention to detail, mutual respect, and being on time for work. Employees have the opportunity to be involved in every aspect of our farm, from planting, managing, harvesting, and marketing fresh, local, naturally grown produce. Time Commitment: Farm Employment begins as early as March 1st, and continues through the first week of December. We are looking for full time (40 hours/wk) and part time (20 hours/wk) positions depending on applicants availability. Compensation: We pay $9-10/hr, plus food products from our farm. We offer campers located 5 minutes from our farm with utilities. The cost to stay in a camper is $80/ month plus a split utility cost (approximately $10/ month). We intentionally try to hire employees who are geared up to farm themselves one day, or continue on in a "carrier" within sustainable agriculture. Just as important as fair financial compensation, we strive to provide apprentices with a professional experience on our farm. Produced on Farm: Rock Springs has its own personal vegetable garden as well as livestock cows and goats. Farm Employee Responsibilities: Fence repair, barn cleaning, gardening, weeding, etc. Compensation: Can provide temporary housing (deducted from pay), must have a vehicle, no pets. $12-15/hour without housing, $8/hour with housing. Best Time to Contact: Early morning and early evening. Produced on Farm: We cultivate a small 1/8th acre garden presently but most of our production is meat production. We humanely raise, slaughter and sell rabbit, pork, eggs and poultry through the Food Hub, some markets, and direct to consumers. 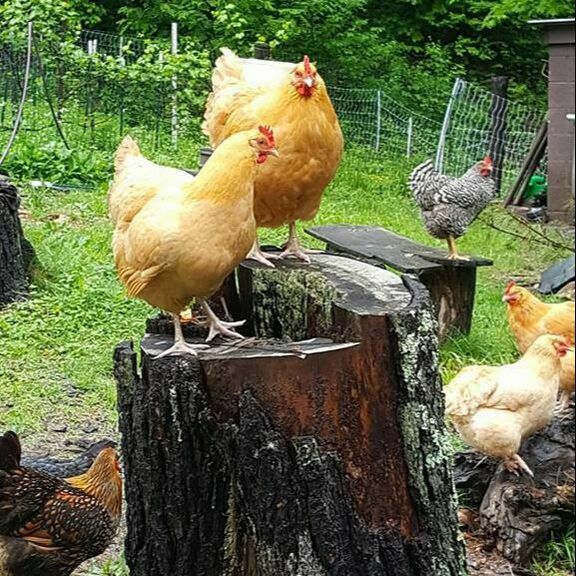 ​Markets: Presently, we sell through the High Country Food Hub predominately, but also have limited CSA poultry/egg shares through a partnership with Full Moon Farms. 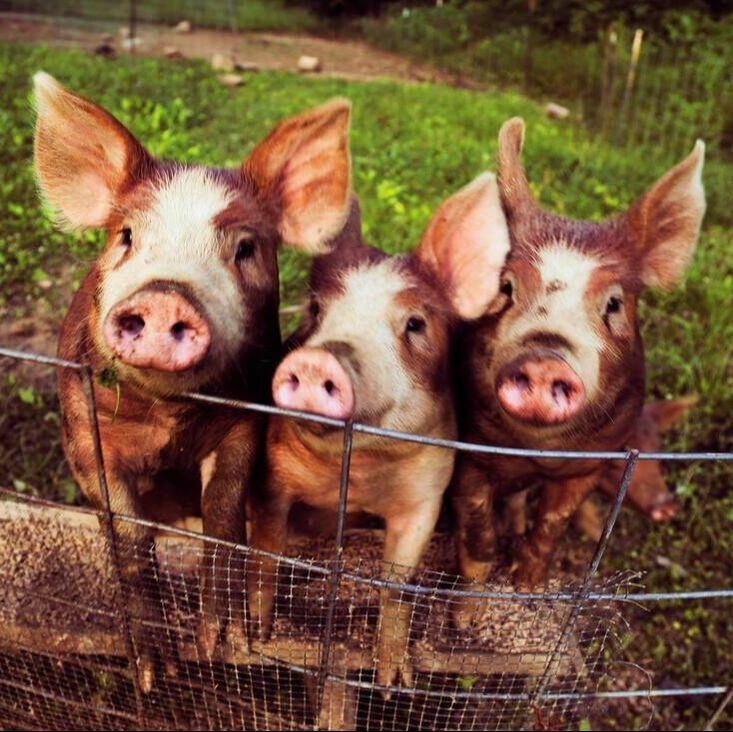 ​Keywords about this farm: Pastured livestock, CSA, vegetables, permaculture, agroforestry, homesteading. Intern Responsibilities: Depending on time, talent, and need we will pair the intern with jobs available. Presently, our greatest need is for clearing, brush removal, animal rotation planning, and orchard cultivation/preparation but we have a glass greenhouse that also needs to be finished; a barn to build and are in the process of a significant expansion of fencing for goats. Preferred Experience: More than experience, we're interested in applicants who have passion for permaculture design, organic growing, sustainable building practices, the farm business and humane animal husbandry. Time Commitment: A 10 hour a week commitment would be a good start. We accept applications on a rolling basis. We can also accommodate WOOFERS or an intern who wants to trade labor for living on site in a vintage camping paddock with water/power. Compensation: We offer a cash stipend of $500 for two months work (no more than 10 hours a week) + camping accommodation (water/power/paddock) + a lot of knowledge. Produced on Farm: Vegetables, Cut Sunflowers, Eggs, Pastured Pork, Grass Fed Beef, Hay, Timber, and Firewood. Markets: We market our products through our seventy member CSA, which is in its tenth year, at the Watauga County Farmers' Market, to New Appalachia, and to restaurants in the Boone area. ​Other information: We are a second generation family farm with three members of the family operating the farm full time. We have been operating without chemical inputs since 1979! We make our living off of the farm and have a business approach to the summer season. We have fun on the farm but production is the number one goal and the same seriousness is expected from any employee. If you want to come learn how farming is done come spend the summer with us. Keywords about this opportunity: Sustainable, CSA, Farmers' Market, Family Farm, Vegetables, Livestock. Employee Responsibilities: We expect employees to come to work at a set schedule and begin work promptly. The bulk of tasks will be weeding, planting, and fertilizing but will sometimes include harvesting and washing for market and our CSA. A willingness to learn the most efficient way to complete the work is a must. If an employee has an interest in other aspects of our farm (such as livestock, wood production, or hay making) they can help as need to gain experience in those areas. We often expect an employee to complete a task alone so an ability to learn how to complete a task correctly after a few times is essential. Good awareness of what the completed task should look like is very important to the work. Preferred Experience: A basic knowledge of gardening is necessary but formal experience is not required. Most important to us is someone who will come to work on time and work hard while here. We are a production oriented farm and need employees to understand that the season is short and we try to pack as much production into it as possible. All tasks are very physical and virtually all work is done outside, sometimes in less than favorable conditions. Prospective employees need to understand this before applying. Time Commitment: The job could start in early or mid May and go until the middle or end of August. We would like someone to work 30-35 hours per week. This work could be spread between three to five days. If an employee has an interest in learning about selling at a farmers' market then we would pay for work on Saturday mornings from 6:30-11:30 AM. Compensation: We pay $8.00 per hour (compare to a stipend of $1,120 a month at 35 hours a week). We also have a sit down lunch on the farm everyday, usually cooked from our products, that an employee is welcome to join in on. Also, all the excess produce you can eat (within reason). This posting closes on: This posting closes when filled. Produced on Farm: We focus primarily on Certified Organic vegetables, small fruit, an ever expanding orchard and cut flowers. In 2019 we are bringing back honeybees after a little break and are so excited to be expanding our cut flower production! Markets: Watauga County Farmers Market, Two CSA's (we deliver to Watauga Medical Center and also offer pick up on the farm), Artisanal Restaurant, High Country Food Hub, on-farm produce stand, multiple other local restaurants in the High Country. Intern Responsibilities: No farming experience is necessary but quitters are NOT encouraged to apply! We strive to teach interns how to grow food and flowers from seed to harvest to market. In between there will be a lot of work that includes maintenance of our crops. Everyday on the farm will be different. The primary responsibilities of our interns is to have a good work ethic, to be receptive to learning new things and to communicate effectively with others on the farm. This is a learning experience for everyone and we are looking for good people! I have hosted a lot of interns and volunteers on my farm over the past years and am always excited to forge the new bonds that farming inevitably creates. Time Commitment: I am looking for 2-3 full time interns (40 hours/week) and 2-3 part time interns (20 hours/week). To get the most out of this internship, I encourage interns to commit to the entire season (April-October) but I'm willing to be flexible for the right person. Compensation: $500/month full time interns and $250/month part time interns. On farm living is available. Interns will also receive vegetables that we grow. This posting closes on: By April 1st or when filled. ​Other Information: Going into our 11th year of farming, we are a small female-owned farm. Our farm is located 10 minutes outside of Boone. Produced on Farm: Harbin Hill Farms is modeled on the Elliot Coleman/JM Fortier approach to four-season, intensive, organic market farming. Our main focus currently is on organic fruits and vegetables (including three hoop houses, a raised bed garden in the orchard, and a 1/2 acre of row crops), and an apiary, currently with 7 hives. We also have a small layer chicken operation (currently 20 hens), and next spring will begin a pilot operation on industrial hemp. We sell through a combination of farmers markets, restaurants and a CSA. This is our third year of full time operation, and our intention is to develop a demonstration farm that incorporates appropriate technologies and organic practices to create an environmentally sustainable and financially profitable farm.​ We offer intensive insights into the nature of a start-up operation, which has succeeded in doubling both production and sales each year. ​​Markets: Farmers Markets, Restaurants, a CSA and various retail outlets. Intern Responsibilities: We are looking for interns who really want to learn, are enthusiastic about playing in the dirt, have a good sense of humor, and enjoy the company of like-minded people. We have 42 acres or relatively flat land, including 26 acres of woods (with hiking trails), a barn, chicken coop, and goat shed, so there is considerable development potential, including various farm critters, mushrooms, medicinal herbs, vermiculture, value-added fruit and vegetable products, agri-tourism, etc.. Interns will be encouraged, but not required, to research, design and implement at least a pilot phase of their own project, from which they can keep any profits over the coming season. We are serious about farming, but not about ourselves. A good sense of humor is essential! Preferred Experience: Interns should be aware that farm work is outdoors and involves hard, sometimes quite repetitive, physical labor under a full range of weather conditions. Previous agricultural experience is desirable but not essential. A strong desire to have their own intensive market farming operation in the future is preferred. Time Commitment: We have three internship models, two involving a full-time schedule and one part-time. The season begins March 15 and ends November 15, but interns do not need to commit for the entire season. Our full-time schedule can be either live-in or live out. The full-time interns work 7:30 am – 3 pm weekdays, and assist with the farmers' market on Saturdays (from 7 am to noon). The hours for part-time interns can be more flexible, and are open for discussion. Our main season begins in April, and goes through October. During that period, we can be reasonably flexible with the time commitment, especially while school is in session. Our primary internship model is based on a 30 hour week - six hours a day, five days a week -- similar to the WWOOFer program. Compensation: We can provide meals for all interns during their shifts (breakfast, lunch and dinner), and - for a limited number of interns - full room and board. Other than the psychic income of working in the fresh air with highly compatible and like-minded individuals, however we do not provide a financial stipend. Other Information: Dinner and overnight accommodations are available for interns who will be participating in the Saturday morning farmers' markets. This posting closes on: This posting does not close. Applications will be accepted on a rolling basis throughout the season. Markets: We focus on three main market channels: weekly farmer's markets (Tuesdays and Saturdays), CSA programs, and local restaurants and online marketplace. ​Intern Responsibilities: It is essential for perspective interns to understand that farm work is very physical. We do our best to vary the tasks throughout the day, in order to prevent too much time being spent on one job; however, farm work is often repetitive by nature and very physically demanding. It is important to be realistic and honest about your past work experience and physical stamina. Preferred Experience:All that is required is for interns to have a passion for local food and a desire to learn more. Previous experience is a plus, but not necessary. Preference will be given to those who express a strong desire to farm in the future. Compensation: Stipend amount will be based on experience and is negotiable, but generally, we start at $600/month. We offer a 2 week, unpaid trial period, during which both interns and farmers can evaluate if an arrangement for the season is mutually beneficial. After two months, a $25/week raise can be expected. Compensation also includes: 1 dozen eggs per week, 1 lb sausage per week, 2 whole chickens per month, organ meats and unlimited produce. This posting does not close, rolling applications are accepted through the end of the season. Interested applicants can contact the farm for a more detailed description of the position and for an application. Intern Responsibilities: Physically demanding, sometimes repetitive work, love the outdoors in any weather, a desire to want to learn farming, about the local food economy, and an open-minded and fun loving demeanor will help. A passion for clean food, good living, and the outdoors is preferred. ​Employee Responsibilities: We expect employees to come to work at a set schedule and begin work promptly. The bulk of tasks will be weeding, planting, and fertilizing but will sometimes include harvesting and washing for market and our CSA. A willingness to learn the most efficient way to complete the work is a must. If an employee has an interest in other aspects of our farm (such as livestock, wood production, or hay making) they can help as need to gain experience in those areas. We often expect an employee to complete a task alone so an ability to learn how to complete a task correctly after a few times is essential. Good awareness of what the completed task should look like is very important to the work. Keywords about this farm: Grass fed beef, pastured pork, pastured chickens, handmade soaps, historic cabins for rent. Volunteer Responsibilities: Volunteers are expected to be determined, creative and communicative. We share all farm tasks with interns and volunteers. We will always be in the field working along side you to ensure you are learning and enjoying the work. Work responsibilities include: starting seeds, monitoring plant health, regular horse care, fence maintenance, crop cultivation, irrigation, harvesting and processing for sale, delivering the CSA pick-up, break down of field materials after crops finish, and much much more. Preferred Experience: Applicants can hold any experience they see as applicable to keep their motivation high, optimism flowing, self-care substantial and physical abilities adaptable to farming. We seek volunteers who want to learn to grow food and better know themselves in the process. Communication is key and each person is welcomed with their unique communication style. As we work with horses, volunteers must be willing to be near these animals and handling them if able. ​Time Commitment: Volunteers can work a regular schedule or at farm work days from April 1 - October 3. Compensation: Vegetables are sometimes available for volunteers. Experience working on a farm and FUN is guaranteed! This posting closes on: is always open. Markets: We sell at the King Street Farmer's Market, to the Food Hub, to a dozen area restaurants and at our on-farm produce stand. Internship Responsibilities: Interns are expected to be determined, creative and communicative. We share all farm tasks with interns and will always be in the field working alongside you to ensure you are learning and enjoying the work. Work responsibilities include: starting seeds, monitoring plant health, regular horse care, fence maintenance, crop cultivation, irrigation, harvesting and processing for sale, attending farmers markets, break down of field materials after crops finish, and much much more. Interns can apply for 2 - 4 days a week, 8 hours each day, april through november. Compensation: We offer a gas stipend and you can have as much produce as you can eat. Experience working on a farm and FUN is guaranteed! Contact: fullmoonfarmer@gmail.com or (828) 964- 3644 Kara Dodson. Best Time to Contact: Monday - Saturday, 8 - 5 by phone. Markets: Produce goes to the Bread of Life kitchen, food boxes and donation based sales that support many diverse garden projects.We ascribe to the philosophy of "food for all regardless of means." The Hospitality House Garden Stand is set up at our Community Events and our Summer Food Series. It offers surplus produce and eggs through a donation based system to local folk, staff and residents. Keywords about this farm: The Gardens at Hospitality House provide organically raised eggs, vegetables, fruits and herbs for the Bread of Life Community Kitchen and the Food Box Program. Residents and Volunteers maintain the gardens throughout the summer. The garden supports our commitment to the sustainability of life, community and environment. Intern Responsibilities: We work to rebuild lives and strengthen community by providing a safe, nurturing, healthy environment in which individuals and families experiencing homelessness and poverty-related crises are equipped to become self-sufficient and productive. We need interns who can commit to a consistent schedule, can work on their own, and work with residents and oversee volunteer groups. Work with residents and clients require understanding and agreeing to Hospitality House confidentiality policies. There are opportunities to provide education programs for our individuals, families and children. Record keeping, reporting, marketing and promotion, social media and helping manage the Garden Stand are non-garden work tasks that we need assistance with. Time Commitment: This is a flexible position with hours to be determined after completing the application form and process found here. Compensation: This is a volunteer position. Interns are welcome to have meals at the Hospitality House Bread of Life Kitchen, participate in the donation based Garden Stand and may be able to take home produce or a food box as needed. Markets: All of the produce we grow are donated to Four partners and locations – our local food pantry, Share-the-Harvest Market (an attempt to get the community to share their excess garden produce), Bounty and Soul, and Green Opportunities. Intern Responsibilities: Since the intent of the internship is to pass along knowledge, we do not have specific experience requirements. All thing being equal, we may, however, give preference to those with a gardening background or those pursuing a career/lifestyle in the work we do. We are looking for applicants who are: highly motivated, flexible and adaptable, collaborative, display gratitude, follow directions while sharing their opinions, independent workers, in good physical condition, have a sincere desire to learn about sustainable food production, hunger issues, and community building, value quality work, and are able to maintain a clean, safe and organized work space. This is a hands-on internship. You will be immersed, get dirty, be challenged, and be encouraged to use your gifts – not just your muscles. Engage in physical work and activity regardless of weather. Get up early especially in the summer and be ready to work on time. Eventually lead and teach groups and individual volunteers (Do you enjoy people?) Study and apply sustainable, organic, traditional and alternative growing practices. Participate with the crew in all aspects of growing food (cultivation, planting, transplanting, harvesting, washing, distributing…) Participate in upkeep and maintenance of the interns’ common space. Time Commitment: Interns agree to participate in the internship program from the time they arrive in late March or early April until the last day in October. A 1- month trial period is part of the internship. Interns are expected to work aprx 35hours / week. Interns also assist in setting up, helping with and taking down 1 - 2 fundraising events per season. We have not finished creating a new schedule for the 2019 season but interns will definitely work: M – F 7:30 – 12:30 pm, Wednesday evenings from 5:30 – 8:15 pm, some (rotating) Monday markets from 2:30 – 6:15 pm, and some flexible time in the afternoons or evenings. Basically weekends will be free except for crucial chores such as watering which will be worked on a rotating basis with another intern. Compensation: Housing, full season interns receive $400/month stipends (summer interns do not), garden produce, some basic staples (grains & beans), education, personal growth and immersion into an amazing community. Interns are expected to supply their own work clothing and shoes, bedding, sunscreen, laundry soap, toiletries, and take appropriate precautions to work safely. We provide insect repellant, gloves, garden produce and food staples. Interns should have their own health insurance coverage. The Lord’s Acre does not assume responsibility for any medical expenses of the intern and we are not required to provide Worker's Compensation insurance. In addition, vacation time of a week or so is available during the growing season. ​Intern Responsibilities: Dependable. Help plant, maintain garden, harvesting, maintain animals, some land clearing, maintain barn & chicken house. Will include other manual labor responsibilities. Preferred Experience: Good work ethic and ability to do manual labor. Commitment: There are opportunities year-round. Hours can be worked out per person based on abilities and availability, but frequently occur early in the morning with an afternoon break and finish work in the late afternoon. We begin with an orientation day as soon as availability of the intern and continues dependent on availability and class schedules. Compensation: We offer an unpaid educational internship experience as well as gas money, a share of crop, and some meals with the potential of paid-stipend for dependable helpers. ​Intern Responsibilities: No experience is required, but we strongly encourage an interest in growing/ farming/ gardening/ homesteading as well as a willingness to learn. We expect interns to have a strong desire to be on the farm. We strongly encourage interns to take personal inventory of their commitment to long, physically demanding days, sometimes repetitive tasks and often grueling weather conditions. We share all farm responsibilities with interns from seeding in the greenhouse to planting in the fielding, harvesting, processing, marketing and deliveries. While demanding, the work is enormously rewarding and will fill you up, heart and soul! Time Commitment: We ask interns for a part- time commitment of 3 days/wk, 8-10hrs/day from April - Nov. Produced on Farm: Certified Naturally Grown mixed fresh and storage vegetables. We also raise sheep for meat. Markets: We sell to a number of Asheville area farm-to-table restaurants, Knife and Fork in Spruce Pine, and to our local online CSA market with pickup in Celo. ​Intern Responsibilities: Interns are involved in all aspects of growing, marketing, and running the farm. For a more detailed description, please request our application by email. Preferred Experience: Some experience in a garden or farm, being a interested vegetable eater, having done unrelated physical work is helpful. ​Time Commitment: 40-45 hours a week. We don't sell at farmers market, so weekends are free, with the exception of monthly CRAFT tours. Season is from mid March through October or November. Compensation: $550 a month, plus food from the farm and accommodations in the straw bale intern cabin. More Information about this Internship: There is a detailed program description on our application (see website). We cannot host interns who have pets or young children. Couples are welcome to apply. Produced on Farm: A diverse array of certified organic fruits and vegetables. Markets: Watauga County Farmers Market in Boone, Downtown Hickory Farmers Market, CSA, restaurants, New Appalachia distributor, Wilkes County Farmers Market. ​​Keywords about this farm: Certified organic, professional, fun, team, beer-Friday, pickleball, beautiful, valley, Appalachia. Farm Employee Responsibilities: Farm employees will do everything from seeding in the greenhouse, to transplanting, to cultivation and trellising, to mulching (we handle 700 bales of straw a year!) to mowing, to harvesting and washing and packing to selling at farmers' market. Employees will also participate in some planning and management and will be able to run the farm effectively as a team by September when they return from their paid vacations. Preferred Experience: There are no special requirements to work on Tumbling Shoals Farm. The absolute most important aspect of an employee here is being a good team player. Farming is a physically demanding career in the elements, so some experience with a job outside of any sort, especially in southern climates, is a bonus and will be favored. Of course, physical fitness is important. We are not often lifting heavy things, but we keep moving all day long so physical endurance helps us enjoy the work.We recommend that you have your own transportation, as the farm can feel pretty isolated at times, but this is not required. We hope you have an open mind, a quick smile, and a good sense of humor as those things make teamwork more enjoyable. Also, some retail experience is helpful if you are interested in going to farmers' market. Time Commitment: Full-time employment. 40 hours/week beginning March 18th. End dates are more flexible, but guaranteed through September and a couple of people through November. Compensation: $9/hour starting wage (roughly $1440/month if you’re comparing it to a stipend). Lodging is included including electricity in private cabins, electricity, propane, and water in shared kitchen, bathroom and laundry facilities. Employees can harvest and eat anything from the farm at any time, though we encourage them to consider peak harvest windows for any kind of canning or freezing activities. Best Time to Contact: Anytime, until March, then email is best. ​that engaged 115 aspiring, beginning, and established farmers.